The new 2019 Polaris Indy EVO is just the compact chassis sled that can bring new riders to the sport! 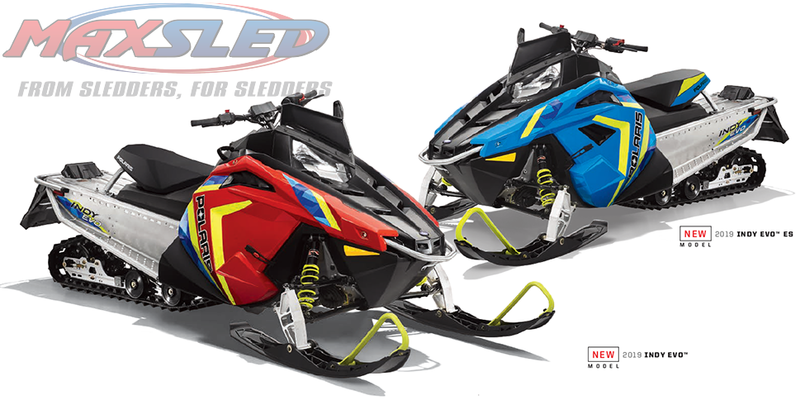 New sled is engineered specifically for new riders. The new EVO is the Polaris team’s answer to one of the industry’s biggest challenges: bringing new riders in. “For years, the only option for a new rider is to get on a full-size sled or to find an older, smaller sized sled,” Wolff explained. One of the challenges, he continued, is that everyone defines an entry sled differently. Polaris, in our opinion, is hitting the opportunity squarely between the eyes. Here’s why: modestly scaled chassis and ergonomics, familiar, scalable power and a solid pricepoint. 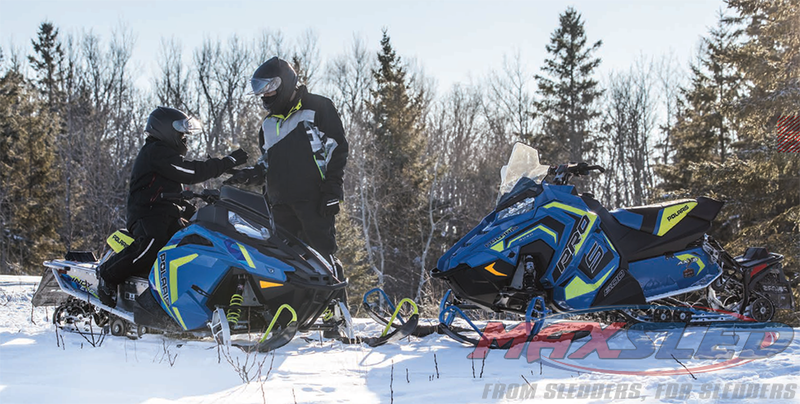 The 2019 Polaris Indy EVO is a scaled down version of the remainder of the Polaris line. The compact chassis and ergos will give confidence to new riders. Polaris seems to have a good viewpoint of the sport’s offerings, past and present. As the purveyor of the Indy 340 for plenty of years, they know firsthand the sales opportunities of a slightly smaller chassis and ergonomic package. New riders aren’t necessarily kids that fit a 120 or 200 model, or maybe they’ve already outgrown those small sleds like a pair of ankle-height jeans. lot of times, they’re teens and young adults. That means they are close to fitting a regular Rush model, but just not quite. The Indy EVO is built to address that. It is 5 inches shorter and 3 inches narrower at the cab than a 600 Rush. Sure, some of that will be accounted for in the EVO’s sporty shorty windscreen. But the seat height is also about three inches lower than a Rush model. That means riders will have their feet firmly planted on the runningboards, not tip-toed at the stirrups. The EVO’s bars are lower and narrower than a Rush’s as well, which means more confident posture for handling the sled through the rough chop and in and out of corners. The EVO also gives up 2 gallons of fuel, but the sculpt of the tank/seat interface is smaller, to riders can scoot up when the riding gets spirited. And let’s be honest, a new rider will be more than happy to take a fuel stop at when his or her 10-gallon tank is getting low. Polaris also scaled down the EVO’s ski stance, as compared to the Rush chassis. The new EVO-specific plastic skis are set to 39 inches out of the box where the Rush is set at 42.5 inches. Polaris designed adjustability to the ski stance to let you tune it to your preference. Normally, a 39” stance would indicate a little bit of a tippy ride, but remember that the entire sled is scaled smaller than the Rush, with a lower center of gravity so riders aren’t likely to get that unnerving ski-pop feeling. Suspensions on the new EVO should be plenty familiar to experienced sledders. A narrowed up Pro-Ride front suspension with RydeFX shocks will likely soak up the trail chatter as well as the wider-stanced Indy models. Likewise, we expect the coupled INDY rear suspension will deliver the same ride quality as the other Indy sleds, because it’s the same skid! The Polaris Indy EVO is big enough and quick enough to deliver true trail riding excitement for everyone. Instead of sinking cubic dollars into a new engine platform, or turning to the industrial engine market, Polaris simply took the 550cc fan-cooled engine it knew and applied a bit of electronic engineering to it. Out of the box, the EVO is electronically governed to max out at 50 MPH. That’s plenty of power to get a new rider hooked on the sport, without getting outrageous. That said, when you’re ready to step it up, your local Polaris dealer will have an accessory tuning kit ready to open up the power. The engine power is delivered to the full-size 121” x .91” Shockwave track through the same clutching system as the other 550 models in the lineup. Again, Polaris was smart about its development strategy: dealers have parts in stock already and when an EVO rider graduates up to a full-size chassis, they will have some familiarity with the mechanical workings of their next sled. The 2019 Polaris Indy EVO is available in a pull start and electric start version, at a price that’s going to be tough to beat! We’ve sat in more product planning meetings than we care to remember, offering advice to product planners and engineers. The one thing we have always said is that the first company to deliver a real-live snowmobile for $6,000 or less will win the game. The 2019 Polaris Indy EVO overachieved that mark, with an MSRP of $5,299 for the pull start and $5,699 for the electric start models! With pricing like that, families can afford to buy a new sled for their beginner, instead of relegating them to old, beat-up hand-me-downs. And we all know that if someone feels good about their new sled, they’re going to want to ride it all day, every day. The other, more lucrative market for this sled is really in the commercial rental fleets. When you can offer a sled that fits a wide range of riders confidently, is performance-governed for beginners, and uses currently-available maintenance parts for $5,300 you have exactly what fleet operators are hoping for. With a compact chassis and ergonomic package that will fit a broad range of riders, a familiar and scalable power delivery system and a pricepoint that is really going to be hard to beat, we are confident Polaris has found an answer to the age-old dilemma of how to bring new riders into the sport with the 2019 Indy EVO!